Horizon Zero Dawn Review: Could it be GOTY? Alright, let’s just get this out of the way up front: I think, and a lot of my colleagues agree, that Horizon Zero Dawn would easily be a shoe-in for Game of the Year in any other year. We all know that there’s a giant Tri-Force shaped wall blocking that path right now. I’ve thought a lot about how Horizon Zero Dawn and Zelda: Breath of the Wild are similar and different over the past week, but I want to mostly avoid that in this review. I will say this one thing, however. This game felt nearly perfect to me, an easy 9/10 maybe 10/10, then I played BOTW and I thought “well, if Zelda is a ten then Horizon can’t be — because Zelda is just a smidge better.” And let me also add that I’ve never played a single game in the Legend of Zelda from start to finish (I’ve borrowed and played many, but never truly dove deep into it), so I’m not a “Zelda fanboy” by any means. Horizon Zero Dawn has a compelling narrative and setting. For the past decade, we’ve gotten Post-Apocalyptic narrative overload; that’s why Horizon‘s Post-Post-Apocalypse setting is so refreshing. It makes sense that as a culture we would move past constantly consuming Post-Apocalyptic stories like The Walking Dead and onto stories like Mad Max: Fury Road and Horizon Zero Dawn. I for one am super grateful for this because I’ve gotten so sick of the former. I’m sure most readers already know this as Horizon is a hugely popular game, but in case you don’t, here’s the spoiler-free premise of the game: in the near future, civilization progressed to include regular use of advanced robotics, holographic technology, and artificial intelligence, then something happened to cause humans to regress back to tribal societies. We don’t know what that something is at the start of the game and that’s one of the central mysteries driving the narrative. 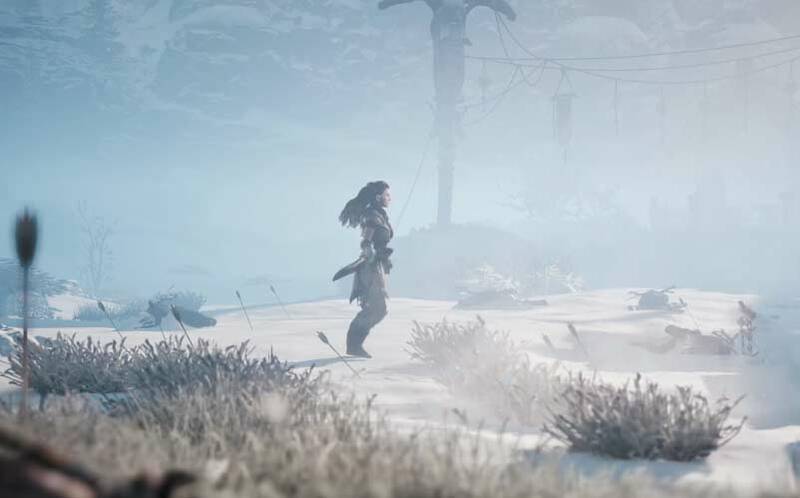 The game starts with the player assuming control of Aloy, a young orphan who has been shunned and labeled an “outcast” by one of Horizon‘s many tribes, the Nora. Aloy does not know who her mother is or why she’s been shunned, so she determines to find answers by winning “The Proving,” a Noran hunting competition that rewards the victor with anything they desire. But she is not yet old enough so she must spend the next decade or so preparing. 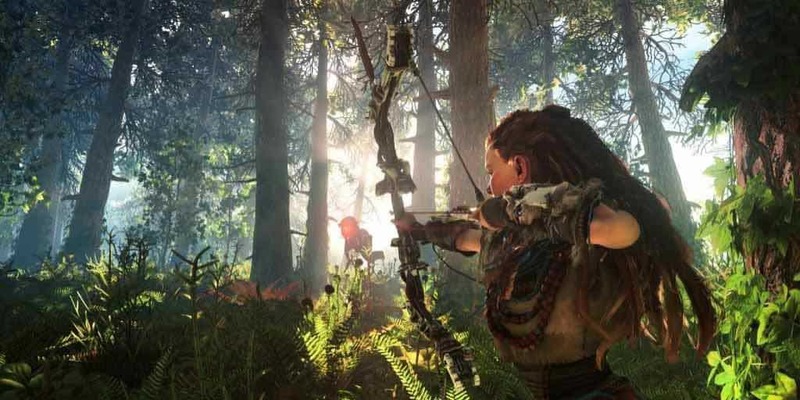 After discovering a rare piece of powerful technology from the time of the “Old Ones” and training with her guardian, Rost, the now teenage Aloy has little trouble navigating a world inhabited by dangerous robotic animals and archaic tribespeople. Around the time of “The Proving,” an incident (that I don’t want to spoil) occurs, which sets Aloy’s true adventure into motion. She leaves the Noran homeland, a place that never truly felt like home, on a quest to help the people who treated her like a pariah her whole life. But her real journey is one in search of answers; who are her birth parents, who is she, and what happened to the world? Horizon‘s main adventure is interesting and engaging for a number of reasons, and many of them are character-related. Aloy is, in my opinion, a perfect action RPG protagonist because she is unique and developed enough to make us truly care about her, but not to the point that we can’t fully relate to and project ourselves onto her. Through reading a small group of male gamers’ criticisms about playing as a woman in Horizon Zero Dawn, I came to the realization that most people seem to think of RPGs as games where you either control cipher characters that are essentially blank slates or characters that are idealized, heroic versions of ourselves. So some people feel the character on the screen needs to look like them or be fully customizable in order for them to make a connection. But the genre is called “roleplaying games” not “create-a-character games,” and that’s exactly what you do in Horizon – you play the role of Aloy. I find it easier to connect with and care about a character like Aloy who is a little more complex than a mute, nondescript “hero of legend” like Link, for example. Then again, that’s a different game that serves a different purpose (I don’t think most Zelda fans play for the enthralling stories and character development). Actually, I believe what I was starting to discuss in the tangent above explains why this game grabbed my attention and held onto it. Up until this year, I was never a big fan of open world games. Horizon was the first time I really enjoyed the story and characters of an open world game. I used to think I didn’t like this genre because it felt too overwhelming, but now I know that’s only because there wasn’t enough keeping me engaged. Open world games usually feel disjointed to me; the narratives often seem like afterthoughts, the missions like glorified fetch quests, and the main character boring. But I never felt any of this when playing Horizon Zero Dawn. Aloy’s not the only interesting character, either. Without getting into too much detail, there are several NPCs with large parts and even minor “side quest givers” who I will actually talk to past getting the info I need – because I like spending time with them. Some are funny, some are terrifying. And I rarely play games where I exhaust all dialogue options just to hear what the NPCs have to say. Two big reasons why the characters actually feel funny, terrifying, and ultimately real are the facial animations and voice acting. Not all of them are home runs, but the voices in Horizon are pretty strong, especially Aloy. Voice acting has to be complemented by animations that sync up and also convey emotion, and Horizon does well in this regard too. I will say, however, that I have noticed some weird little animation hiccups when minor characters are talking and some can appear pretty lifeless. Overall, though, all of this is still above-average. I’m not somebody who is overly concerned about graphics; in fact, I think it’s pretty low on the list of what makes a game great, but it certainly doesn’t hurt when a game looks pretty. And Horizon Zero Dawn is a damn pretty game. Everything in Horizon – the weather effects, gorgeous natural lighting, animal movement, water shimmer, and more – looks real, and the world lived in. The most impressive visuals in the game, though, are the robotic beasts. There’s nothing else quite like climbing to the top of a moving Tall Neck, surveying the land, then hacking the machine so you can reveal more of the map. Well, I guess climbing the towers in Assassin’s Creed is similar, but those towers aren’t moving artificial organisms. There are over twenty more different types of machines aside from the Tall Neck (the giant dinosaur-looking one that was featured in all of promos, by the way) and all of them have similar color schemes but look quite different. They also all have distinct ways of moving and attacking. The only real letdown for me in this area is probably the human enemies. They all basically look the same, and that wouldn’t be too bad if their designs weren’t rather uninspired and generic. However, the good news is you don’t really have to look at them too much if you don’t want to as a lot of the missions where you fight them are optional “bandit camp” side quests. If there’s one thing that elevates Horizon Zero Dawn from good game to great game it is the combat. First off, it’s just a lot of damn fun. Bow and arrow combat isn’t wholly new, but it’s pretty rare that a whole system is built off of it. This was great for me because I’ve always preferred using the bow weapon in any game that features it. And it’s never felt better. The combat system in Horizon becomes complex and nuanced once you add the targeting mechanic. It also makes the fight feel fair. 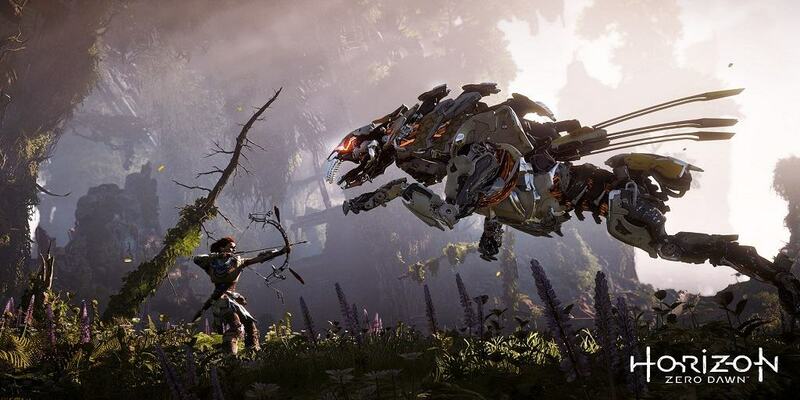 Aloy isn’t a super-powered god like Kratos and she’s also not some helpless survival horror character, and that’s because she can pinpoint specific weak points on each robotic behemoth. You can unlock a skill early on that allows you to slow down time for a few seconds and that helps a great deal too. Before even entering a fight, though, you’ll often spend a few minutes scanning your enemies to find their weak points and plan a strategy. Finally, add in Aloy’s dexterity and dodge rolls and reflexes become a big factor. Once you mix the planning, targeting, aiming, and reflexive dodges you get the building blocks of a solid combat system. What kicks all of that up a notch are the varieties of elemental ammo types. There are fire, shock, freeze, tear (strips enemies’ weapons), and corruption (like poison) arrows and each one has a valid use depending on the robot you’re fighting. The machines not only have baseline elemental weaknesses but each body part has different weaknesses as well. What’s really cool about fighting machines in Horizon is that each fight plays out like a boss battle; the machines have a set number of attacks and abilities that they repeat and it helps to learn the patterns. But where Horizon differs is that most of the attacks are tied to components that you can shoot off their bodies and if you do that the enemy can no longer use that attack. You don’t have to approach combat this way, though. Horizon also features unique secondary weapons. There’s the Tripcaster (I use this quite a bit) which allows you to put down elemental trip wires to stun or damage enemies. I’m not sure if I’ve ever seen anything quite like this where you fire at the ground once then a second time to place the wire exactly how you want — there’s been traps, proximity mines, and trip lasers but all of those you just drop without aiming. Then there’s the Ropecaster, a device that attaches a rope to the machine then anchors it to the ground. Depending on the size of the machine, some will require multiple ropes. This is good for buying yourself some time to escape or aim and, even better, to root an enemy so you can then walk up and critical hit them with your spear. And the rest of the weapons — aside from the standard bow variations like the sharpshooter and war bows — are far less effective in my personal experience. There’s Horizon‘s version of a grenade launcher which can be good for afflicting large groups of enemies with AOE damage or status effects like freeze, but it just doesn’t really hit hard enough to be viable. Lastly, the Rattler is a short-ranged heavy machine gun type weapon that rapidly fires bolts. I haven’t even used this weapon, to be honest, so I can’t really say what it’s like. It’s not really my style. What’s also not my style, in this or most games, is melee combat. That’s good news for me because Horizon‘s melee combat is the game’s biggest weakness. It feels clunky and is just kind of boring to use; you can tell it wasn’t a concern for the developers. The spear does have advantages in some situations, like knocking off enemies’ weapons, but I barely use it. I guess, technically, I do use the spear for sneak attacks, but that’s not really melee combat as much it is using stealth. All you need to know is there’s a light attack and heavy attack and you can’t really chain combos — it’s just lackluster. Perhaps other people use the spear, especially if they leveled up the knockdown skill, but I imagine even those people would say it’s not as fun as long range combat. What ties everything together in Horizon Zero Dawn are the little systems. Some of these things can go overlooked, but in my eyes, they’re the crucial glue that makes it all stick. I’m talking about the “survival” elements like gathering and crafting. There are a ton of things to pick up in Horizon and every one of them has a purpose. Even the collectibles that would normally serve no gameplay purpose in other games — and because of that I’d ignore them because I’m not a completionist — actually have a role, but I don’t want to spoil what that is. You should be constantly picking up Ridgewood and medicinal herbs in the wild, collecting parts from slain machines, and hunting game for meat and skins. Wood, wires, fuel canisters, and metal shards are all used to craft arrows and ammo. And you will likely run out of certain types of ammo often. Then there’s the aforementioned herbs that you use to fill your medicine pouch. The healing system is a really cool thing I’ve never experienced in a game before. Aloy has a red health gauge and a green medicine gauge below it; you can drink medicine whenever you want to replenish health and then the difference is subtracted from the green gauge. It’s not like your standard potion in other games which is a disposable item that can be wasted. For example: if you have 200/250 health and 100/100 medicine then press up on the d-pad, you’ll end up with full health and 50 less medicine. If you want to survive in Horizon Zero Dawn, it is incredibly important that you keep that medicine pouch topped off. The best tip I can give anybody is to invest in the medicine pouch skill upgrade ASAP. 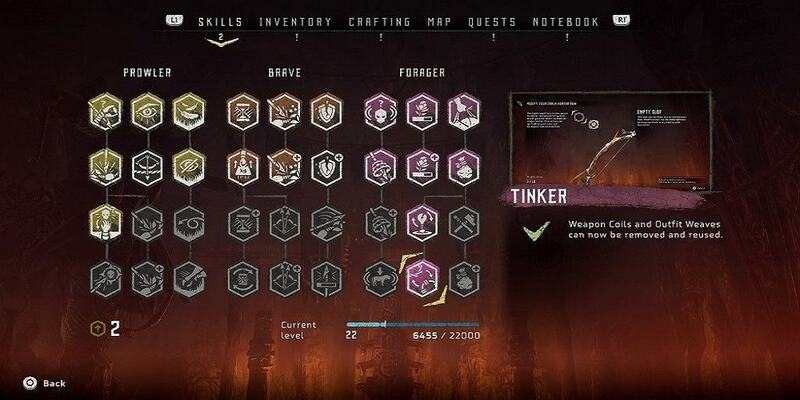 On the topic of tips, I personally believe the survival skill tree is your best bet early. But if you find yourself losing a lot of fights, then upgrade some of your combat skills first. You gotta win fights and stay alive before you can craft anything. Horizon is a game with a lot of crafting and resource management, so investing in those skills is crucial. I would recommend the skills that give you more resources when you gather and loot machines as well as the one that enables you to craft more ammo for the same amount of resources. Every arrow your fire has to be crafted from materials in the world — you never just pick up ammo like it’s a first person shooter. Actually, almost everything in the game requires resources, whether it’s trading with merchants, crafting items, or upgrading carry capacity. Because of this, upgrading your resource carrying capacity should be a top priority early on. To do this you need to hunt certain animals for their parts. All of this makes sense thematically too, which is another reason why I feel these little systems truly hold it all together. Even the savepoint and fast travel systems are tied into the wilderness survival theme. You save at bonfires scattered around the world, then once you do so you can fast travel there… but only if you have a fast travel camping pack. Unlike Dark Souls, bonfires only serve these two purposes and are not for leveling up (I automatically associate them with leveling up now). Aloy will level up when you hit enough experience and you will get a skill point as well as a max health increase. The rest of the traditional RPG stats are behind the scenes and out of your control. This makes how you use your skill points and what you spend resources on very important — I love that. I also love that metal shards are the currency as well as the main crafting ingredient in arrows, so an interesting dynamic is created where you have to weigh purchasing and killing power. The last thing I want to add about exploring and surviving in Horizon Zero Dawn is that it’s never a bad idea to fight with instead of against the machines. Aloy can learn how to “override” the machines and turn them into deadly allies or a trusty mount. There are underground dungeons called Cauldrons scattered around the world and if you complete one it gives you the ability to hack into a group of machines that all have the same override symbol. Cauldrons are some of the most fun, but also challenging, parts of the game. There are (very) lite puzzle elements, a few baddies, and a big boss at the end. Best of all: they are technology-laden environments that give a little glimpse into the world of the “Old Ones.” It’s actually quite refreshing to switch it up every once in a while with Cauldrons that look completely different from the world and feature linear gameplay. I think it’s possible to complete the game without setting foot inside a Cauldron, but why would you want to do that? It’s great fun and results in you getting to ride a robot tiger. One thing that didn’t really fit anywhere above but is super important to me is difficulty. I can’t stand games that don’t offer the slightest bit of challenge. Conversely, good games can be hellishly hard but shouldn’t ever feel “unfair” (Dark Souls is the perfect example of hellish and fair). A truly great game in my eyes is difficult enough to feel challenging and rewarding, to push you to keep getting better, but never so hard that you accept the dreaded “Game Over” screen instead of continuing. I personally want to see those words “Game Over” at least once every two hours. And I’ve seen it quite a bit playing Horizon Zero Dawn. If you’re like me, I highly recommend bumping the difficulty up before starting (you can lower it at any point). I’m glad Horizon delivered in this respect because that was the only thing I was concerned about when purchasing the game. I knew I’d love the rest. Sure, fighting the human enemies and melee combat in general is a little underwhelming, but everything else is top notch. From the story and characters to the combat and exploration, every aspect of Horizon Zero Dawn is just about flawless. I’ve gotten over 50 hours out of this game thus far and I’m not even close to done with it. 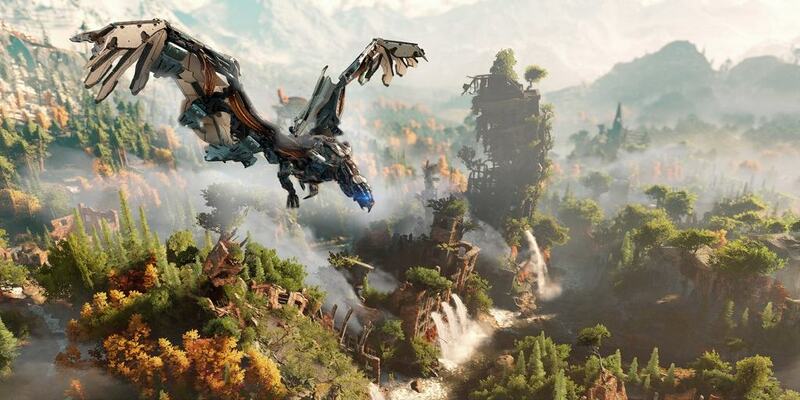 I played Horizon every day the week it released, and I was pretty sure I’d give it my first ever perfect review score… but then another game came out. There’s something so polished, so special, so fun about said game that I can’t see it being anything short of a perfect ten. But if that’s perfect and Horizon is slightly worse, then I can’t reasonably give this a ten as well. Horizon Zero Dawn is definitely a must-buy in our book. If you have a PS4, you owe it to yourself to play this game as soon as possible (and if you don’t yet own a PS4, it’s worth buying one for). We’re already ready to go back to running the Nora wilds, leaping from tree to cell phone tower, hunting all manner of big, menacing metal beasts and adorable fluffy bunnies — sorry bunny, mama needs to upgrade that pouch!